Now that it is officially summer time, it means it is time for everyone to get outside and enjoy some fun in the sun. However, for seniors, this fun time in the sun can come with a number of risks. While everyone should be careful of skin cancer from too much sun exposure, seniors are at an even higher chance of getting this devastating condition. While many people focus on making sure that young kids are wearing sunscreen, it is just as important to help make certain that seniors are protected as well. Skin cancer caused by excessive sun exposure, is the most common form of cancer in the United States and while it is treatable, surviving this type of cancer hinges on catching the disease early. Seniors tend to be as risk because they have lower defenses against skin cancer, weaker immune system and because their skin tends to be thinner and more fragile as they age. Senior men are also more likely to develop this disease rather than senior women. If you are helping look after a senior loved one, this summer you will want to focus on helping them prevent or delay the development of skin cancer. The first and most important step of course is to try to help limit your loved one’s exposure to UV rays. 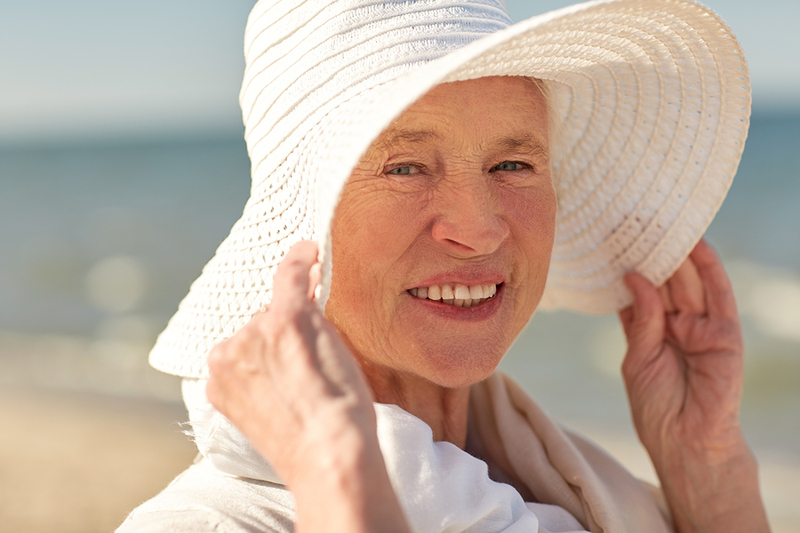 When seniors do need to go out in the sun they need to take protective measures including covering their bodies with loose, yet comfortable covering clothing and wearing plenty of sunscreen. Make sure that seniors are wearing a hat when out in the sun. Many seniors have light or thinning hair and can easily suffer from sunburns on their head and face, even if they think they are protected. Don’t forget that sun rays can still be strong even when it is overcast or when the weather temperatures are low. Seniors are still at risk during these times. Make sure that seniors are staying away from tanning beds. These beds have UVA rays in them that cause skin cells to age more rapidly. Seniors should try to avoid the sun from 10 a.m. to 4 p.m. when possible as this is when UV rays are the strongest and most harmful. Pay attention to the sunscreen your loved one is using. SPF 30 will filter 97 percent of UVB rays while SPF 50 will stop 98 percent of UVB rays. Most sunscreens only protect against these types of rays, but if you want to keep your loved one really save, you can look for sunscreens that also protect against UVA rays. Apply sunscreen 30 minutes before going outside and make sure your loved one is reapplying throughout the day. If you are worried about a certain area of skin, see a doctor or dermatologist to rule out skin cancer. Your doctor may either remove the skin and do a biopsy, or perform an ultrasound using clear ultrasound gels and an ultrasound machine to the particular spot. Little steps like this can go a really long way in making sure your senior loved one is staying as safe as possible in the sun this summer and that they are lowering their chances of developing skin cancer this season.